I love to find gentle picture books for kids, the ones that reach out to children’s hearts and minds and stay with them long after a reading is shared. 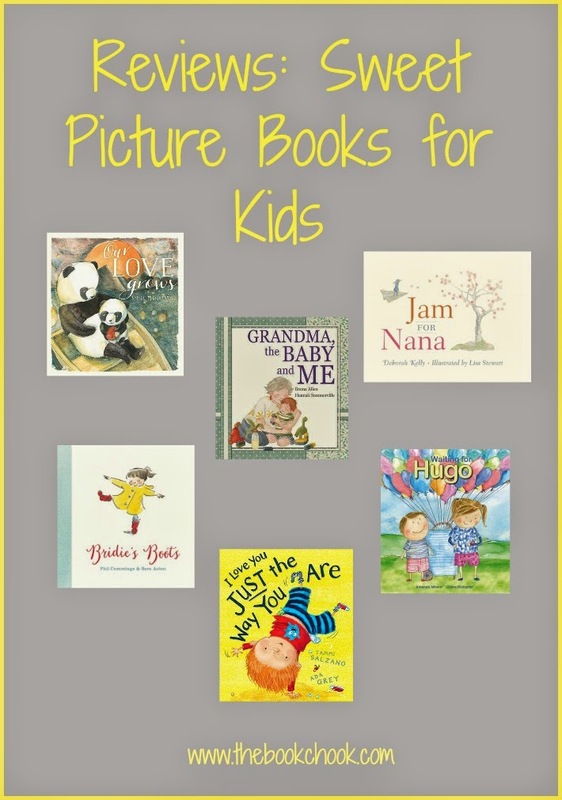 Here are some recently published children's picture books for you to consider. Jam for Nana is a children's picture book written by Deborah Kelly, illustrated by Lisa Stewart and published by Random House (2014). From the publisher: When Nana makes pancakes, I spread the jam. I smooth it right to the edges with the back of my spoon, until it looks like a giant orange sun. Then we roll them up tightly, dust them with sugar and lick our fingers. In this beautifully written picture book a little girl goes to the ends of the earth to find real apricot jam for her beloved grandmother. Jam for Nana is a sweet and gentle children’s picture book. The story is ultra simple, and describes a little girl and her nana making pancakes. Nana longs for the jam made from apricots she enjoyed in the old country when she was a child and the little girl finds a way to remind her of it. I also loved that the book celebrates the special relationship between a grandmother and her granddaughter and that the muted palette used by Stewart so beautifully complements Kelly’s spare evocative text. Bridie’s Boots is a children's picture book written by Phil Cummings, illustrated by Sara Acton and published by Working Title Press (2014). From the publisher: When Bridie receives a pair of gumboots wrapped in rainbow paper for her fifth birthday she is delighted. They are the best boots ever! Just right for splashing in puddles and twirling on tiptoes. But when she turns six Bridie decides her boots should go on a big adventure. Bridie’s Boots shows us a little girl’s fondness of a beautiful pair of yellow boots she receives for her 5th birthday. She goes striding and splashing in these boots, and in her imagination she wanders off on adventures when she wears them. But when she’s six, the boots don’t fit anymore, and Bridie must let her boots go on their biggest adventure of all. Acton’s energetic watercolour illustrations help us share Bridie’s feelings. This is a lovely book for introducing children to the concept of sharing their loved objects with others, and pondering similarities and differences in children’s lives across the world. Find habitually excellent Teacher Notes by Janet McLean at the Working Title website. Waiting for Hugo is a children’s picture book written by Amanda Niland, illustrated by Claire Richards and published by Windy Hollow Books, 2013. I loved the depiction of the two main characters, in both words and images. We meet them first on the front cover: a slightly worried big sister, checking her watch, and a beaming little bother absorbed in a rainbow of balloons. Big Sister is also the narrator and she explains Hugo likes to take his time and count things. There are always things to count, so that means the family does a LOT of waiting for Hugo. Like any normal child, Big Sister can become exasperated. But the story shows the positive side of youngsters like Hugo, and the siblings end the book on an uplifting and happy note. Most of us have encountered kids with Autism Spectrum Disorder, but it’s not always easy to find ways to explain it to others or to support family members. I think Waiting for Hugo is a charming, simple and effective portrayal of such a child. Niland doesn’t talk down to young readers, but tells it like it is. If you need an excellent resource to support diversity and inclusive education in your school, check out Waiting for Hugo. I Love You Just the Way You Are is a children’s picture book written by Tammi Salzano, illustrated by Ada Grey, and published by Koala Books (2014). RRP: $14.99. Here’s a Mum talking to her son, telling him how she loves him from the moment he wakes up with spiky bed hair, through to playing, creating, running and reading time, until at last he falls asleep at night. Grey’s energetic and colourful illustrations bounce along with Salzano’s playful rhyming text in this enthusiastic celebration of the mother-child bond. It makes a great read-aloud, and youngsters will enthusiastically identifying things they do too. Grandma, the Baby and Me is a children’s picture book written by Emma Allen, illustrated by Hannah Sommerville, and published by Omnibus Books (2014). RRP: $24.99. Children often have trouble adjusting to the arrival of a new baby in a family. It’s not surprising when you factor in exhausted parents and our society's obsession with cuteness. Luckily, Henry has Grandma to help him through all the koochie-koo and smoochie-smoo, the crying and the changes. I love the way Allen and Sommerville portray an ordinary family coping with reality and show us different perspectives. Yes, this is a sweet picture book, but it’s also realistic and never cloying. Kids will feel for Henry and perhaps understand a little better if a new baby comes into their lives. There are some creative and thought-provoking Teacher Notes to accompany the book at the Scholastic website. Our Love Grows is a children’s picture book written and illustrated by Anna Pignataro, and published by Scholastic Press (2015). RRP: $16.99. Pip is an adorable, roly-poly little panda, who’s playful and curious. In Our Love Grows, Mama explains to him how he will grow, just like the world around them. Kids ask lots of questions. Aside from perennial favourites like “Are we there yet?” and “When’s dinner?”, we also hear more philosophical queries. There’s a world of longing behind “When will I be big?”, and Mama Panda answers Pip in gentle rhyming verse about how things have already changed from when he was tiny. The muted watercolour illustrations are sweet and gentle as a mother’s love. The Fairiest Fairy is a children’s picture book written by Anne Booth, illustrated by Rosalind Beardshaw and published by Nosy Crow (2015.) RRP: $Au 22.99. Poor Betty! She’s always getting into messy muddles. She can’t paint a rainbow, or scatter dewdrops and her pirouettes are, well, pretty precarious. You see, with so many animals to rescue and friends to help, there’s just no time for Betty to practise all the things a fairy should. But when it come to the Fairy Ball, Betty’s friends return her gifts of kindness and it becomes clear who is actually the fairiest fairy of them all. A charming rhyming story with an uplifting message for ages 3+. Some kids adore fairies - and this fairy is absolutely adorable. Even non-fairy converts will relate to Betty, who tries really hard but somehow gets tangled up in all sorts of disasters. 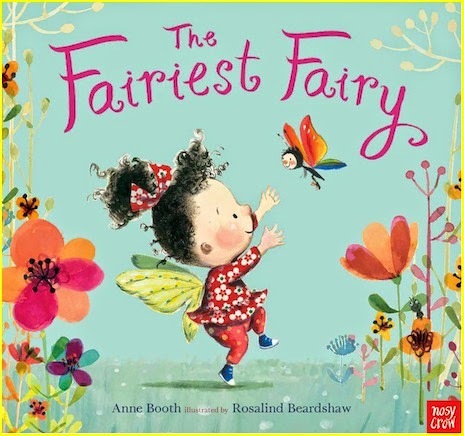 The rhyming text bounces along, and Beardshaw’s fairies look a lot like gorgeous toddlers with wings and wands. Grown-ups won’t be surprised by the ending, but I think kids will be cheered by its hopeful message of persistence, and kindness paying off. You might also like to grab some Activities for Children's Book Week 2015 and Children's Book Week 2015 - Challenges for Kids.